Nearly everywhere I go in this city, I keep a camera handy. That’s one reason I don’t have an SLR and instead go with a smaller point and shoot camera: I need to be ready to take a picture the moment one presents itself. 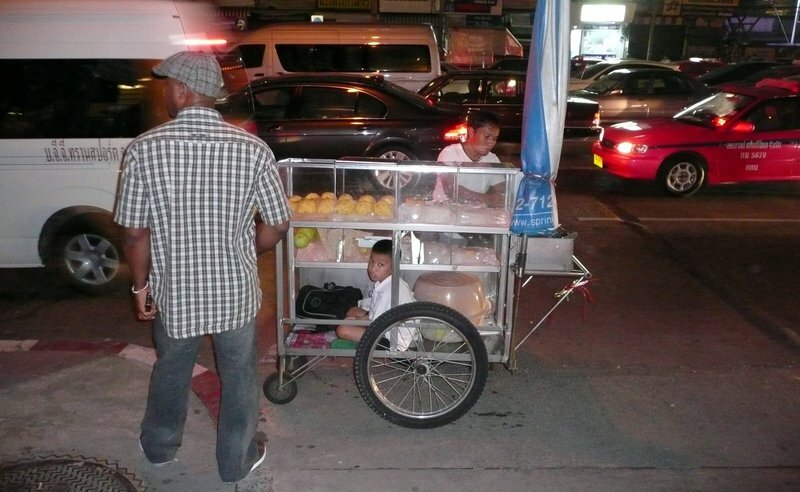 The other evening, walking with my Thai tutor back towards the Asoke Skytrain station, I watched as a fruit vendor rolled past us in the street, his son sitting on the shelf under the cart. “Oh, he’s selling children and fruit!” my tutor exclaimed. Allusions to child trafficking aside, it was a pretty funny image. When he stopped to sell some pineapple to a tourist, I snapped a photo. The young man hitching a free ride didn’t seem amused. I wouldn’t be if I was riding around in the bottom of a fruit card, either. But not a bad deal, if you think about it. With ice in the display cases, it was cooler than being out on the street, and with dad doing the pushing, you could just enjoy what little breeze there was. Still, it reminds me that I was fortunate to grow up in better circumstances than this. I hope the young man finished his studies and has the chance to go to university. This entry was posted in Uncategorized and tagged Bangkok, Fruit, Krungthep, Life, street, vendor by christao408. Bookmark the permalink. Being a fruit vendor sounds like a really hard way to make a living – if it is possible selling fruit. hahahaha i wonder why that kid is tagging along with his dad if he doesn’t want to ride in the cart? i think it’s a far better option than having to walk everywhere; i dunno, i think it would be kind of fun. i can’t imagine trying to make a living by selling fruit though; that’s got to be tough. I’m curious, what’s the temperature like in Thailand now? It does feel safe I would do it if I could. I guess the kid is better off being under some supervision vs. left alone at home (given the lack of alternatives).I’m always surprised by the ability to make a living out as a street vendor in less developed countries (thinking about it, I’d add coffee / donut / bagel carts in NYC!). These sites are very common in India. Sometimes children WANT to go out and be with their dads, especially at night, like this one here. I really like these street scenes. Just curious, do you get any reaction from the subjects? Same thing I see in the Philippines. Like you, I hope the boy will get to finish school. @arenadi – Back in kind of a hot pattern, lows about 80 highs about 88. Looking for another low pressure system to drop down from China again – it has been two weeks since the last one. @ElusiveWords – Depends. The father smiled and went on slicing fruit. The boy was kind of neutral. I get friendlier reactions outside of Bangkok, where farang taking pictures is more of a novelty. I also get friendlier reactions when I speak with the people whom I’m photographing. @icapillas – @ZSA_MD – Yes, not so different from what you might expect in India or the Philippines. At least he knows who his father is (assuming that that is his father) and has him around. @TheLatinObserver – I’d kill for a bagel cart here in Bangkok…@Wangium – It might be kind of fun. One of those childhood memories of things that, once you reach a certain age, you no longer do. @kunhuo42 – @murisopsis – @yang1815 – Street vendors are an ever-present part of the streetscape here. Thais love to snack (the translation of the word “snack” is play-eating) so having so many ready sources of relatively healthy food is a good thing. I’d love to write in more detail about vendors but haven’t the time right now to dedicate to such a project. @christao408 – The weather is about the same right now. Have you gotten used to it yet? It’s so odd having winters like this; or late fall — December, and it being 80-90°F. People I talk to are incredulous that I’m sitting here sweating because there’s no wind and it’s extremely hot and humid. Kinda cute to see a little boy (must be a size xs) hiding inside a fruit cart! I saw a lot of these fruit carts whenever I walked along the streets of BKK, but I never bought fruit from them, have you tried any? I think this is so cute. The kid is getting to see how hard his father is working and in the process will have a better appreciation for everything. @arenadi – It took a few years but after four I’m getting used to it. Now I can detect the subtle shifts between the seasons. What a difference five degrees and twenty percentage points on the humidity makes! Truthfully, though, I’d like to live somewhere where there’s a bit cooler weather in the evenings at least part of the year. Maybe one of the mountainous areas to the north or northeast of Bangkok. @Dezinerdreams – Let’s hope he does. The big challenge is him learning to appreciate what he can do to get ahead in this world. @CurryPuffy – The fruit hasn’t been a problem for me. I suppose on the grand hygeine scale it isn’t the safest thing but they keep it on ice and burn through it pretty quickly. Most of them are also good about not directly handling it but using utensils, which helps with the concern of germs. Anytime I’ve been to a poorer country, I’ve always felt the need to count my blessings for the way that my parents were able to support me growing up. I really hope that those boys are able to make a good life for themselves. Ahhh yes!I remember the days I would travel in a fruit cart. Well, it was more of a car and my friends and I were usually just heading to the bar but the sentiment is there. hahaha, that actually brings back memories of when I was that age and we went to Hechinger’s (a local Home Depot-type place) to buy wood and drywall for fixing up the house, and my dad would push me around on the massive carts you had to use for trucking around big pieces of those materials. It was a lot of fun. I bet those kids are having an awesome time. @Carolina17 – That sounds like a lot of fun. @marc11864 – Memories a little foggy, Marc? =D@TheCheshireGrins – There’s nothing like travel to make you count your blessings. That is very true, Meg.